Adam Haseley bats during the first inning of Sunday's game against Detroit at Publix Field in Lakeland, Fla.
CLEARWATER, Fla. -- Gabe Kapler walked off the field Monday afternoon as another sun-soaked, spring-training game had come to a close. His team scored 12 runs. The new shortstop had two hits. And Maikel Franco -- who was nearly discarded before the Padres won the services of Manny Machado -- drove in four runs. So what caught the manager’s eye? Haseley, the team’s top pick in 2017, will be shuffled sometime in the next few weeks across the complex to minor-league camp. He knows his time on the major-league side is limited. But after Monday’s 12-7 win over Detroit, the outfielder will not be leaving without making a strong impression. Haseley grabbed Kapler’s attention in the eighth inning when he hustled down the first-base line on a grounder and forced a throwing error from the second baseman. Haseley then stole second base, moved to third by tagging up on a fly ball to center, and scored on a sacrifice fly. 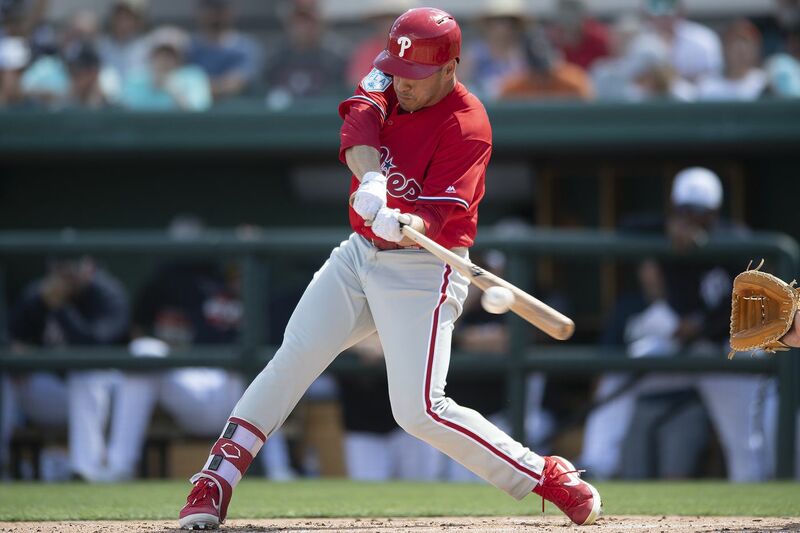 It might have been his hustle that grabbed Kapler’s attention, but it will be his bat that the Phillies hope will drive him toward the majors. The Phillies said Haseley was “everything you look for in a hitter” when they drafted him eighth overall. The 22-year-old from the University of Virginia has since delivered as he finished last season at double-A Reading, where he batted .316 with an .880 OPS in 39 games. He said he’s enjoyed just observing how the major-leaguers -- players he said he grew up watching -- prepare for the season. Haseley, perhaps even at the start of the season, will reach triple A in 2019 and be just one step away from joining the big-leaguers. Odubel Herrera’s important spring training continues to be delayed as the Phillies are now classifying his sore left hamstring as a Grade 1 strain, Kapler said. Utility player Sean Rodriguez played as a designated hitter, which was a good sign after it was thought last week that he might require surgery to repair a meniscus injury. Rodriguez, in camp on a minor-league deal, is competing for a bench job. ... Ranger Suarez will start Tuesday afternoon against the Yankees in nearby Tampa.